Remember the adage, “All that glitters is not gold?” Well, the same goes for diamonds and, unfortunately, I’ve had many customers who find out the hard way that the beautiful diamond bangle or ring they bought is not valued at what they paid for it, and isn’t, in some cases, even a diamond. As a jewelry retailer and gemologist, I am often the one who has to break that news to customers who bring in a piece for repair. Specifically, a woman brought in a beautiful bracelet with diamonds and smaller stones that she thought were also diamonds. They weren’t – they were moissanite – a much-less-expensive stone. For example, a one carat diamond might cost $5,000, while a similarly-sized moissanite might only set you back $700. Others bring in stones that are laser drilled. Laser drilling is a way to enhance the clarity of a diamond by removing flaws (called inclusions). The process involves using laser to drill tiny holes (thinner than a hair) in the stone, all the way from its surface to an inclusion inside. This channel is then used to remove the inclusion by either melting it with heat or dissolving it with acid. In the U.S., the Federal Trade Commission. does not require an explicit disclosure of laser drilling enhancements when diamonds are sold. But why is it so important to know if a diamond has been treated this way? Well, it turns out that laser drilling can sometimes cause problems. Drilling tiny channels within a diamond weakens its structure. These are just a few reasons that you should purchase only from jewelers with the highest gemology credentials – those from the Geological Institute of America (GIA). I graduated from the Institute in 1991. It has enabled me to ensure that all of my gems and jewelry are as they appear to be – authentic stones without lower-cost additions and without laser repair of flaws. I’ve been in business for 20 years and am proud to have many returning customers because they know that they are purchasing quality items. 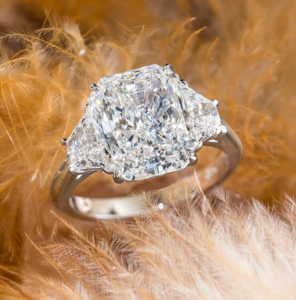 So important has the gemologist certification become that most insurance companies will not insure items that come from jewelry stores without a gemologist on staff. If you’re now concerned whether you have a diamond that may have been laser drilled, you can take it to a gemologist or look at the certificate that came with it. A diamond report issued by the G.I.A. will list the drill holes in the stone, if there are any. If you don’t have a certificate, or if you just want to inspect the stone yourself, you can always ask to see the diamond under a microscope. Such an examination will allow you to see firsthand how many channels are drilled in the stone you are about to buy. Are Those Diamonds Really Diamonds? If you’re concerned that some of the stones in your jewelry may not truly be diamonds or may be lab-created rather than natural stones, take the piece to a gemologist. If they are not diamonds, you may need a new appraisal on the piece for insurance purposes, too. Do You Know The Four C’s of Diamond Purchasing? This is probably the most important when it comes to determining a diamond’s value and beauty. It shows the skill of the cutter who fashioned the diamond to bring out the brilliance of the diamond to make it sparkle from across the room. The quality of the cut also affects a diamond’s value and can increase it by up to 50%. This is another important thing to look for when buying the perfect diamond, as it can also affect a diamond’s value. Diamonds can have internal characteristics, also known as inclusions, as well as external characteristics that are known as blemishes. A flawless diamond, one that has neither inclusions nor blemishes, is very rare. Clarity is determined by a grader using magnification to look at specific characteristics. Carats are the units of measurement that are used to determine a diamond’s weight, where one carat is equal to one-fifth of a gram and is then divided into 100 points. When you buy a diamond or other gem of value, you want to know that it’s all it’s supposed to be and of the value that you paid for it. Don’t go to a jewelry store and just be dazzled by a specific diamond and setting or because of the color of an emerald, a ruby or other gem. Know what to look for, know what to ask, and make sure that the place of purchase has at least one expert, a gemologist with a GIA certification. Join our mailing list to receive news about events and special offers.